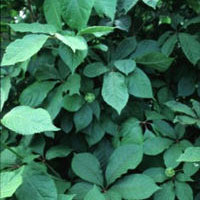 Eleuthero belongs to the Araliaceae family and is a distant relative of Asian ginseng (Panax ginseng). Also known commonly as touch-me-not and devil’s shrub, eleuthero has been most frequently nicknamed Siberian ginseng in this country. Eleuthero is native to the Taiga region of the Far East (southeastern part of Russia, northern China, Korea, and Japan). The root and the rhizomes (underground stem) are used medicinally. “Adaptogenic” herbs such as eleuthero have an immunomodulating effect and help support the normal function of the body’s hormonal stress system.